Each person lives in their own way and has their own difficulties. In some cases, they might break down due to their circumstances but still be cured by people. 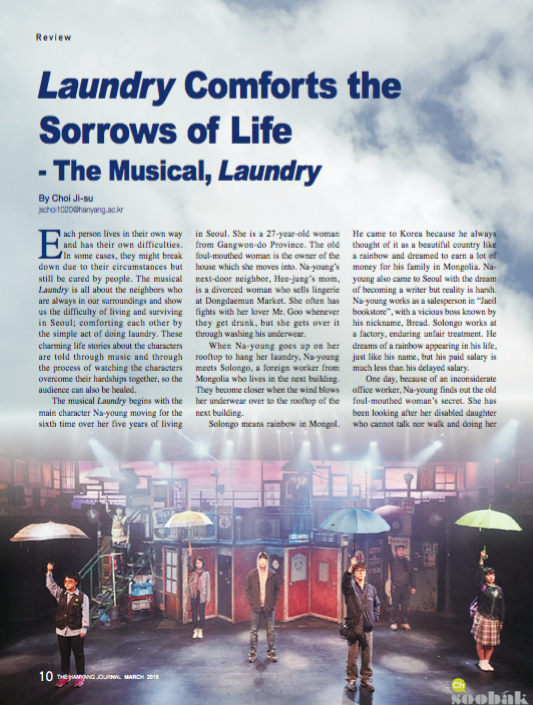 The musical Laundry is all about the neighbors who are always in our surroundings and show us the difficulty of living and surviving in Seoul; comforting each other by the simple act of doing laundry. These charming life stories about the characters are told through music and through the process of watching the characters overcome their hardships together, so the audience can also be healed. The musical Laundry begins with the main character Na-young moving for the sixth time over her five years of living in Seoul. She is a 27-year-old woman from Gangwon-do Province. The old foul-mouthed woman is the owner of the house which she moves into. Na-young’s next-door neighbor, Hee-jung’s mom, is a divorced woman who sells lingerie at Dongdaemun Market. She often has fights with her lover Mr. Goo whenever they get drunk, but she gets over it through washing his underwear. When Na-young goes up on her rooftop to hang her laundry, Na-young meets Solongo, a foreign worker from Mongolia who lives in the next building. They become closer when the wind blows her underwear over to the rooftop of the next building. Solongo means rainbow in Mongol. He came to Korea because he always thought of it as a beautiful country like a rainbow and dreamed to earn a lot of money for his family in Mongolia. Na- young also came to Seoul with the dream of becoming a writer but reality is harsh. Na-young works as a salesperson in “Jaeil bookstore”, with a vicious boss known by his nickname, Bread. Solongo works at a factory, enduring unfair treatment. He dreams of a rainbow appearing in his life, just like his name, but his paid salary is much less than his delayed salary. One day, because of an inconsiderate office worker, Na-young finds out the old foul-mouthed woman’s secret. She has been looking after her disabled daughter who cannot talk nor walk and doing her diapers laundry for almost 40 years. For the old foul-mouthed woman, fluttering diapers hanging on the laundry line has been the evidence of living. Na- young and the foul-mouthed old woman become closer by understanding each other’s pain. At Na-young’s workplace, she is mistreated by her boss when she defends her co-worker who had been working at Jaeil Bookstore for 15 years but was unfairly dismissed because she spoke out against the boss. Na-young is forced to leave the store to work at the book storage in Paju or quit her job. Angry and discontent, they go drinking with their other co-workers. On Na-young’s way home, she meets Solongo. He was also fired and did not receive his 3-month- salary. While they are walking together, they meet some drunken people who pick a fight because a Korean girl is with a foreign worker. Solongo does not counterattack at all. He endures all the kicks and is unilaterally beaten. Na- young asks Solongo, crying, “Why doyou let yourself get beaten?” and he answers that he cannot go to the police or he would be deported. Since he is an illegal immigrant, whenever he suffers unfairness and feels frustrated, all he can do is just endure his sadness. That night, the old foul-mouthed woman’s disabled daughter is racked with a high fever. She calls her son, who lives in Incheon, to come over and take his younger sister to the hospital, but he rejects her. So the old foul-mouthed woman asks Hee-jung’s mom to help her as a favor and she immediately puts the daughter on her back and runs to the hospital, where she is stabilized. new day full of happiness. other side of our reality. In society, there has been discrimination of foreign workers and poor labor conditions such as temporary work or unfair dismissals. Facing the wall of reality, with the realization that their dreams at the very beginning are hard to accomplish in such kind of circumstances, the character becomes depressed and loses hope. Yet, even under their circumstances, there is hope that they could overcome such depressions, and they keep on dreaming about the future since they are not alone. Most of the characters in Laundry, Na-young, Solongo, the old foul- mouthed woman, and Hee-jung’s mom have scars on their hearts but they overcome their obstacles by leaning on each other. As the characters wash away their sorrows and stand up to reality, we should also be able to find a way to overcome our difficulties in our lives.